Master chefs might be cooking up the smoked turkey and chicken expected to be served to hundreds at the Silver Spring Civic Center, but it’s lawyers who are behind the dinner. 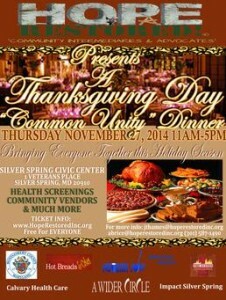 Hope Restored, Inc. has partnered with several organizations throughout Montgomery County to present a community-sponsored Thanksgiving event this year to be held at the Silver Spring Civic Center. This event is supported by the Department of Health and Human Services which will be on site to offer information to community members that do not have access to proper shelter or health care. In a true act of having his “Hope Restored”, Thames reached out to local attorney Robinson S. Rowe, a partner at the Law firm of Rowe, Weinstein & Sohn, PLLC, who in turn provided his full support to ensure the success of this event. “Rowe, Weinstein & Sohn, PLLC, and Hardy’s BBQ have literally saved our Thanksgiving this year for hundreds of our Montgomery County Residents. They are true friends of mine, of Hope Restored, Inc., and to our community. Through partnerships like this we are beginning to put our community back together.” Thames said. Hope Restored, Inc., will now be able to offer to the homeless, to the needy, to any and all members of our community, an award-winning Thanksgiving meal to be prepared by Corries and Roxie Hardy, owners of Bethesda’s “Hardy’s BBQ,” Thames said in a release. Hot Breads & Cakes will also be contributed to the meal, Thames said. “The individual businesses and members of our community have truly come together to benefit the greater good this year. I am extremely proud that residents from our community will have access to valuable information and services from community providers, while sharing an exquisite meal with neighbors and new friends,” he said in a release. “We wanted to step in and help out to make sure the event worked. What Hope Restored is doing is such a great project, we are glad to be a part of it,” Rowe told MyMCMedia Friday. The Thanksgiving event is scheduled to be held at the Silver Spring Civic Building, One Veterans Plaza in Silver Spring, Nov. 27 from 11 a.m. to 5 p.m. You can download a free ticket here.